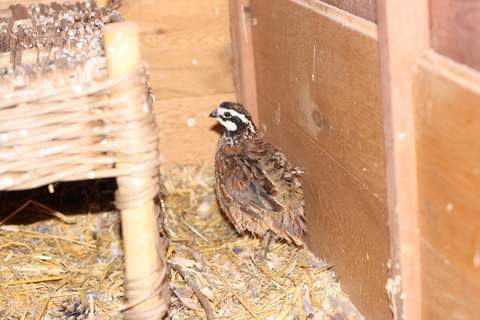 Quail are amazingly easy to look after. Mostly your daily routine should be no more the letting them out and checking food and water. Let your quail out of the house - but not out of the run. They are good flyers and no matter how tame they become you should keep them in the run. If they are let out you will either not find them or not be able to catch them. If by mistake you let them out, we recommend that you leave the run open in case they return for food. 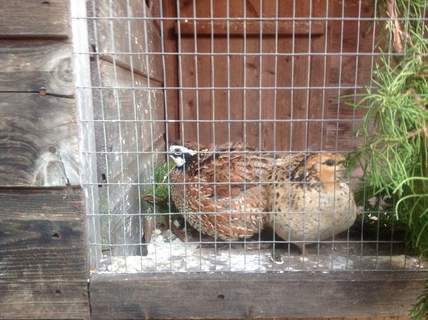 At night you do not need to lock the quail inside the house as they are very robust and hardy. If they do become cold then they will take themselves into the house. They have stout round bodies they do not need combs vasilining to protect from cold and will quite happily take care of themselves in harsh weather. Check that the bedding is clean. As they are small quail do not need cleaning out very often. They spend most of their time outside rather then inside soiling their bedding. However, you should make sure that the bedding is still changed regularly to keep them healthy. Check the position of the shade. The shade is intended to protect the quail from wind, rain and sun so it may need relocating especially if you have moved the eglu to a new position. Good info. but make a point of cleaning them out regularly. And they do require a draughtfree area to sleep in.